James Watt was born on January 19, 1736, in Greenock, Scotland, the son of a shipwright (a carpenter who builds and fixes ships) and merchant of ships' goods. As a child James suffered from ill health. He attended an elementary school where he learned some geometry as well as Latin and Greek, but he was not well enough to attend regularly. For the most part he was educated by his parents at home. His father taught him writing and arithmetic, and his mother taught him reading. Of much more interest to James was his father's store, where the boy had his own tools and forge (furnace to shape metals), and where he skillfully made models of the ship's gear that surrounded him. His father taught him how to craft things from wood and metal. He also taught James the skill of instrument making. As a youngster he played with a small carpentry set his father gave him, taking his toys apart, putting them back together, and making new ones. In 1755 Watt was apprenticed (working for someone to learn a craft) to a London, England, mathematical instrument maker. At that time the trade primarily produced navigational (ship steering) and surveying (land measuring) instruments. Watt found London to be unpleasant, however. A year later he returned to Scotland. Watt wanted to establish himself in Glasgow, Scotland, as an instrument maker. However, restrictions imposed by the tradesmen's guilds (associations of craftsmen) stood in his way. Friends at the University of Glasgow eventually arranged for him to be appointed as "mathematical instrument maker to the university" in late 1757. About this time Watt met Joseph Black, who had already laid the foundation (base) of modern chemistry and of the study of heat. Their friendship was of some importance in the early development of the steam engine. At the University of Glasgow, Watt had become engaged in his first studies on the steam engine. During the winter of 1763–64 he was asked to repair the university's model of an earlier model of the steam engine made by Thomas Newcomen around the year 1711. After a few experiments, Watt recognized that the fault with the model rested not so much in the details of its construction as in its design. He found that a volume (amount of space taken up by an object or substance) of steam three or four times the volume of the piston cylinder (chamber with a moving object inside of it) was required to make the piston move to the end of the cylinder. separate vessel (chamber) rather than in the piston. Such a separate condenser avoided the large heat losses that resulted from repeatedly heating and cooling the body of the piston, and so engine efficiency was improved. It took time for Watt to turn a good idea for a commercial invention into reality. A decade passed before Watt solved all the mechanical problems. Black lent him money and introduced him to John Roebuck of the Carron ironworks in Scotland. In 1765 Roebuck and Watt entered into a partnership. Watt still had to earn his own living but his employment as surveyor of canal construction left little time for developing his invention. However, Watt did manage to prepare a patent application on his invention, and the patent was granted on January 5, 1769. By 1773 Roebuck's financial difficulties brought not only Watt's work on the engine to a standstill but also Roebuck's own business. Matthew Boulton, an industrialist (someone who owns and operates a factory) of Birmingham, England, then became Watt's partner. Watt moved to Birmingham. He was now able to work full time on his invention. In 1775 Boulton accepted two orders to build Watt's steam engine. The two engines were set up in 1776 and their success led to many other orders. Between 1781 and 1788 Watt modified and further improved his engine. These changes combined to make as great an advance over his original engine as the latter was over the Newcomen engine. The most important modifications were a more efficient use of the steam, the use of a double-acting piston, the replacement of the flexible chain connection to the beam by the rigid three bar linkage, the provision of another mechanical device to change the reciprocating (back and forth) motion of the beam end to a rotary (circular) motion, and the provision of a device to regulate the speed. Having devised a new rotary machine, the partners had next to determine the cost of constructing it. These rotary steam engines replaced animal power, and it was only natural that the new engine should be measured in terms of the number of horses it replaced. By using measurements that millwrights (people who build mills), who set up horse gins (animal-driven wheels), had determined, Watt found the value of one "horse power" to be equal to thirty-three thousand pounds lifted one foot high per minute. This value is still used as the standard for American and English horsepower. The charge of building the new type of steam engine was based upon its horsepower from that time forward. On Watt's many business trips, there was always a good deal of correspondence (letters) that had to be copied. To avoid this tiresome task, he devised letter-press copying. This works by writing the original document with a special ink. Copies are then made by simply placing another sheet of paper on the freshly written sheet and then pressing the two together. Watt's interests in applied (practical) chemistry led him to introduce chlorine bleaching into Great Britain and to devise a famous iron cement. In theoretical chemistry, he was one of the first to argue that water was not an element (basic substance of matter made up of only one kind of atom) but a compound (substance made up of two or more elements). In 1794 Watt and Boulton turned over their flourishing business to their sons. Watt maintained a workshop where he continued his inventing activities until he died on August 25, 1819. Watt's achievements in perfecting the steam engine have been recognized worldwide. The watt, a unit of electrical power, was named after him. Champion, Neil. James Watt. Chicago: Heinemann Library, 2001. Robinson, Eric, and A. E. Musson. James Watt and the Steam Revolution. New York: A. M. Kelley, 1969. Sproule, Anna. 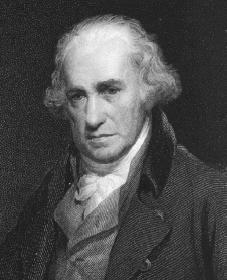 James Watt: Master of the Steam Engine. Woodbridge, CT: Blackbirch Press, 2001.